One in three Americans doesn't get enough sleep, and 45% of the world's population doesn't either. 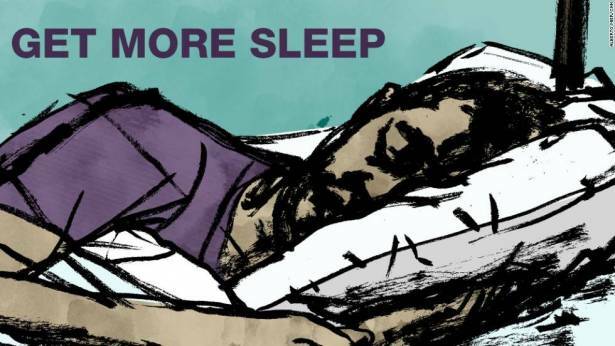 The US Centers for Disease Control and Prevention calls that a "public health problem," because disrupted sleep is associated with a higher risk of conditions including diabetes, stroke and cardiovascular disease. What about Alzheimer's and other forms of dementia? It's well known that people with Alzheimer's suffer sleep issues. Insomnia, nighttime wandering and daytime sleepiness are common for them, as well as other cognitive disorders such as Lewy body dementia and frontal lobe dementia. Researchers followed 321 people with an average age of 61 for a dozen years, as part of the famous Framingham Heart Study. Sleep cycles were measured for each person, and their cognitive skills were assessed in person at regular intervals. Over the duration of the study, 32 people developed dementia. Of those, 24 were determined to be Alzheimer's disease. "Our findings point to REM sleep as a predictor of dementia," study author Matthew P. Pase, of Swinburne University of Technology in Australia, said in a news release. "The next step will be to determine why lower REM sleep predicts a greater risk of dementia. By clarifying the role of sleep in the onset of dementia, the hope is to eventually identify possible ways to intervene so that dementia can be delayed or even prevented." Depositing amyloid in brain tissue is the first known preclinical stage of Alzheimer's and happens well before any obvious symptoms of dementia begin. All participants had known risk factors for Alzheimer's, such as family history or evidence of the APOE gene, which is associated with a greater chance of developing the disease. Their sleep quality was rated on a standard scale that measured amount, quality and trouble sleeping, along with daytime drowsiness and naps. "Participants in our study were willing to undergo a lumbar puncture to move research on Alzheimer's disease forward," said co-author Barbara Bendlin of the Wisconsin Alzheimer's Disease Research Center. "Analyzing this fluid allowed us to look at markers related to Alzheimer's disease such as plaques and tangles, as well as markers of inflammation and nerve cell damage." Tangles are created by damaged tau, a protein responsible for cell stability and structure. Recent research points to tau-tangle accumulation as a possible step beyond amyloid plaques in the development of actual signs of Alzheimer's disease. "Our findings align with the idea that worse sleep may contribute to the accumulation of Alzheimer's-related proteins in the brain," Bendlin said. "The fact that we can find these effects in people who are cognitively healthy and close to middle age suggest that these relationships appear early, perhaps providing a window of opportunity for intervention." That's important, Bendlin added, because delaying the onset of Alzheimer's in those at risk by a mere five years "could reduce the number of cases we see in the next 30 years by 5.7 million and save $367 billion in health care spending." "Another new finding in this study is that daytime sleepiness, and not just disrupted nighttime sleep, is associated with early changes of Alzheimer's disease," said Dr. Yo-El Ju, an assistant professor of neurology at Washington University's Sleep Medicine Center. Ju co-wrote an accompanying editorial for the study and just published research of her own in the journal Brain in which she found that healthy middle-age adults who slept badly for just one night produced an abundance of beta amyloid. A week of disrupted sleep increased the amount of tau, another protein responsible for the tangles associated with Alzheimer's, frontal lobe dementia and Lewy body disease. "Overall, these studies confirms the relationship between early Alzheimer's disease and sleep disturbance," Ju said, "and expand -- in terms of both time and symptoms -- the window in which sleep-wake problems can be assessed for and treated, with the hope of reducing the risk of dementia due to Alzheimer's disease." One of the limitations of Bendlin's study was that the sleep problems were self-reported. Bendlin and her colleagues are recruiting people at risk for Alzheimer's to be studied in a sleep lab, where objective measurements can be taken. "If it turns out to be the case that an intervention which improves sleep also results in less amyloid being deposited in the brain, that would provide strong support for implementing interventions before people start to show cognitive decline associated with Alzheimer's disease," she said. "Increasing amounts of evidence indicate that getting at least seven to eight hours of sleep is essential for brain health and function," Tanzi said. "In the deepest stage of sleep, the brain cleans itself out of plaque and other toxic materials that trigger Alzheimer's disease. This reduces brain inflammation and is entirely consistent with this exciting new study." Not everyone with sleep problems in Bendlin's study had abnormalities in their spinal fluid. For example, those with obstructive sleep apnea showed no association. With over 18 millions Americans diagnosed with the condition, obstructive sleep apnea is one of the most common sleep disorders. It's characterized by loud snoring and waking by gasping or choking, which occurs when throat muscles relax and constrict the airway during sleep. But research presented in July at the Alzheimer's Association International Conference in London found a connection between obstructive sleep apnea and buildup of amyloid and tau proteins in the brain. "Not everyone who experiences sleep problems should now worry about developing dementia due to Alzheimer's disease," she said, adding that therecnn & is not yet a clear cause and effect relationship. "Animal studies suggest sleep affects development of brain changes, but brain changes in turn also affect sleep," Bendlin said. "In terms of figuring out which comes first, brain changes or sleep problems, that will be difficult to tease apart, because the effects really do appear to be going in both directions." "In experimental studies, there does seems to be evidence of both chicken and egg," said neuroscientist Jeffrey Iliff of Oregon Health and Sciences University. "You can drive it either direction. So there may be a bio-directional interaction." That's good news if true, he said, because it means we have may have some control over whether we develop dementia. "No, the public can't remove amyloid plaque," Iliff said. "But if sleep disruption is promoting this process, then improving sleep is half of the solution to slowing the process of dementia as it develops over one's life." Keith Fargo, director of scientific programs and outreach for the Alzheimer's Association, agreed: "There may be an opportunity to improve cognition and possibly reduce dementia risk through early diagnosis and effective treatment of sleep disorders."